Must be in the air. Anne Pearse Hocker just sent this piece from the Guardian about how they may be better at detecting tumors (visually, from X rays) than humans. Their rate of detection is something like 99%. Actually I am not surprised-- much "Dinosaurian" visual acuity exceeds that of us mammals. And Tesla, everyone's favorite Fortean near- alien from Serbia, fell chastely in love with one. 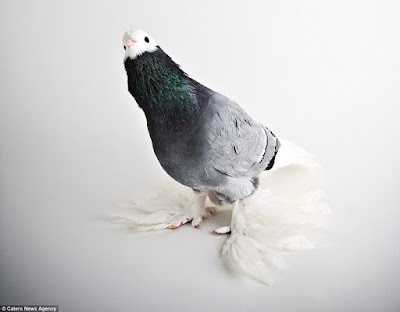 "In particular, he claimed to have a very special bond with a certain white, female pigeon, stating he loved her “as a man loves a woman.” He said that the pigeon was the “joy of his life,” and claimed that one evening she flew into his window, let him know that she was ill, and died in his arms. He insisted his entire life’s work was complete in that moment." I don't like them quite THAT much... only like Darwin did. It's one of the reasons why the preservation of Biodiversity is paramount for our species as well.